Twickenham Stadium has announced today the return of it's much anticipated Christmas showcase, taking place at the stadium, 6th September, and will once again give event organisers a taste of what Christmas will look like at Twickenham this season. The annual showcase will include insights into the complete Christmas packages available at the stadium, from theming and production, to a full tasting of Twickenham's Christmas menu. The venue announced the themes it will be adopting for the season earlier in the summer, following research among its clients into their ideal 2018 Christmas Party. The research showed a variety in requirements where theme and budget are concerned, but all respondents pointed towards a desire for a more 'traditional' Christmas and away from more indulgent events with fussy menus. 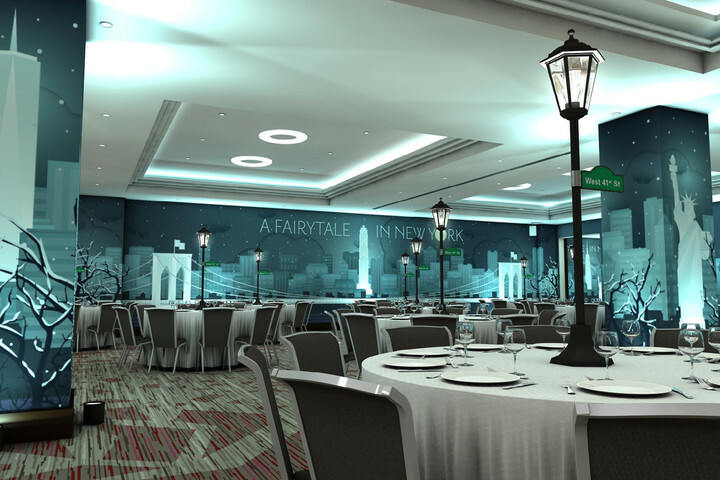 Based on the feedback, the stadium launched an all-inclusive package; 'A Fairy Tale in New York' theme, bringing in elements of New York, the city skyline and Central Park in the winter. Meanwhile, a slightly different twist on the creative will be available throughout the East Stand of the stadium, which launches in Autumn 2018. The new spaces will also celebrate traditional Christmas in a more informal style within the brand new pub available for private hire, The Union Ale House. These themes will be on show to see, feel and taste at the Twickenham Christmas Showcase, 18.00 - 20.00, 6th September, at Twickenham Stadium. Event planners wishing to register their interest should do so at www.eventbrite.co.uk/e/a-festive-evening-with-twickenham-stadium-tickets-26222031803.